Scopulariopsis is a filamentous fungus that inhabits soil, plant material, feathers, and insects. It is distributed worldwide. Several species of Scopulariopsis have teleomorphs which are classified in the genus Microascus. While Scopulariopsis is commonly considered as a contaminant, it may cause infections in humans, particularly in immunocompromised patients. It is a weakly keratinolytic fungus which is highly resistant to benomyl [531, 1295, 2192, 2202]. The genus Scopulariopsis is unique in that it contains both moniliaceous (hyaline) and dematiaceous species, with several being clinically significant. 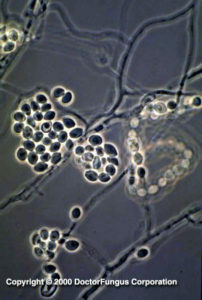 The most common species is S. brevicaulis, a hyaline mould. Other non-pigmented species include S. candida, which remains white at maturity rather than becoming buff-colored, S. koningii, S. acremonium, and S. flava. Dematiaceous or phaeoid members include S. cinerea, the anamorph of Microascus cinereus, S. trigonospora, the anamorph of M. trigonosporus, the Scopulariopsis anamorph of M. cirrosus, S. brumptii, S. chartarum, S. fusca, and S. asperula. Scopulariopsis spp. may cause various infections in humans . It is among the fungi that cause onychomycosis especially of the toe nails. Skin lesions, mycetoma, invasive sinusitis , keratitis, endophthalmitis, pulmonary infections, endocarditis [1534, 1593], brain abscess [152, 963] and disseminated infections due to Scopulariopsis spp. have been reported. Invasive Scopulariopsis infections are seen mainly in immunocompromised hosts, such as bone marrow transplant recipients. These infections are highly mortal [1581, 1629]. One of the most striking features of Scopulariopsis brevicaulis is its association with human deaths by producing arsine gas from arsenate dyes found in wallpapers. (E):Arsenic is a minor constituent of soil. Volatilization and methylation of dimethylarsinic acid and methylation of arsenate and arsenite naturally occur in soil. These bicohemical reactions end up with production of trimethylarsine and dimethylarsine. Arsenic is found in pesticides as well; the currently used ones are methylarsonic acid and dimethylarsinic (cacodylic) acid pesticides. (E):Arsine is the most toxic form of arsenic. At concentrations above 0.5 ppm, it has a garlic-like odor. However, it is toxic at concentrations much lower than this. The whole story started when arsenate dyes were formulated to be used in wallpapers. The most famous of these dyes was (E):Schweinfurter green, one of several green copper-arsenic dyes that were manufactured and incorporated into wallpapers in 1810s. Following the widespread use of these green wallpapers in Germany, France, and other countries, two things drew attention: A garlic odor in some rooms with these wallpapers and the death of people who slept in these rooms. These people got sick and died secondary to tubular necrosis and renal failure. In 1897, the Italian chemist B. Gosio showed that the deaths were due to the production of a gas which could not then be identified. This gas was thus called (E):Gosio gas. This gas was produced by Penicillium brevicaulum, the mould fungus today known as Scopulariopsis brevicaulis. The whole story was clarified by Frederick Challenger in 1945 when he identified the gas as trimethylarsine. We today know the whole mechanism of the production of this gas. Scopulariopsis brevicaulis consumes the starch found in the wallpaper paste. Meanwhile, the fungus converts the arsenate found in the paper to trimethylarsine oxide. Finally, the oxide is reduced to trimethylarsine and the gas, which is toxic and causes human deaths is released. Although the phenomenon was initially related only to Scopulariopsis brevicaulis, other moulds found in the environment may also theoretically be able to liberate volatile arsenic compounds by using the same mechanism. Several phaeoid Scopulariopsis spp. are also clinically significant. Scopulariopsis cinerea, the anamorph of Microascus cinereus, has been reported as the etiologic agent in a human nail infection , and agent of maxillary sinusitis coexisting with Aspergillus repens , suppurative cutaneous granulomata in a patient with chronic granulomatous disease , endocarditis of a presthetic valve implanted after a staphylococcal endocarditis of a native valve , and a brain abscess in a bone marrow transplant recipient . The phaeoid Scopulariopsis anamorph of M. cirrosus is an agent of onychomhycosis  and of a disseminated infection in a pediatric bone marrow transplant recipient . Scopulariopsis trigonospora, the anamorph of Microascus trigonosporus, is an agent of fatal pneumonia in a bone marrow transplant recipient . Scopulariopsis colonies grow moderately rapidly and mature within 5 days. They are granular to powdery in texture. From the front, the color is white initially and becomes light brown or buff tan in time. Reverse color is usually tan with brownish center. Some species may form dark colored colonies [531, 1295, 2202]. Septate hyphae, conidiophores, annelides, and conidia are seen. 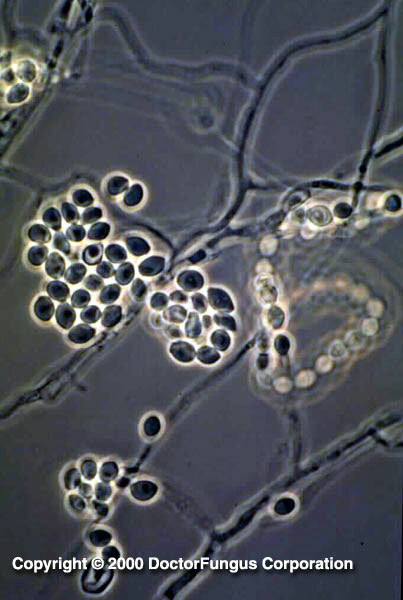 Chlamydospores may be present occasionally. Conidiophores are hyphae-like and simple or branched. Annellides are solitary, in clusters, or form a penicillus; they are cylindrical and slightly swollen. Conidia are one-celled, globose to pyriform, smooth, but more commonly rough-walled, spiny, truncate, and forming basipetal chains [531, 1295, 2202]. Scopulariopsis differs from Penicillium by forming annellides. Scedosporium inflatum differs from Scopulariopsis by forming annelloconidia in wet clumps at the apices of annellides with swollen bases. Very limited data are available. MICs of fluconazole, itraconazole, and the novel azole Syn-2869 are high, suggesting that some azoles have practically no or very limited in vitro activity against Scopulariopsis isolates [22, 1131]. Similar to these azoles, flucytosine MICs are also high , while amphotericin B, ketoconazole and voriconazole MICs are variable [22, 1492, 1864, 2212, 2432]. Noteworthy, terbinafine appears synergistic with azoles against Scopulariopsis brevicaulis isolates . Large scale studies are required for determination of the entire scope of in vitro activity of various compounds against Scopulariopsis isolates of various species. 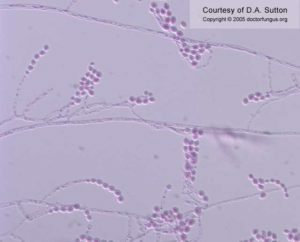 For MICs of antifungal drugs for Scopulariopsis spp., see our N/A(L):susceptibility database.